Pro Quest Information and Learning is a big company managing partnerships with 9,000 publishers worldwide, giving access to a huge amount of periodicals, newspapers, dissertations, articles, reviews and journals – available in a wide range of formats (text and media). Most records are coupled with comments, meta-info and bibliographic data, and the database is daily updated. Pro Quest is the unique off-site repository of digital information for the Library of Congress. Politics and History, Social Sciences and Public Policies are relevant areas of the website, also providing access to public records and archives. 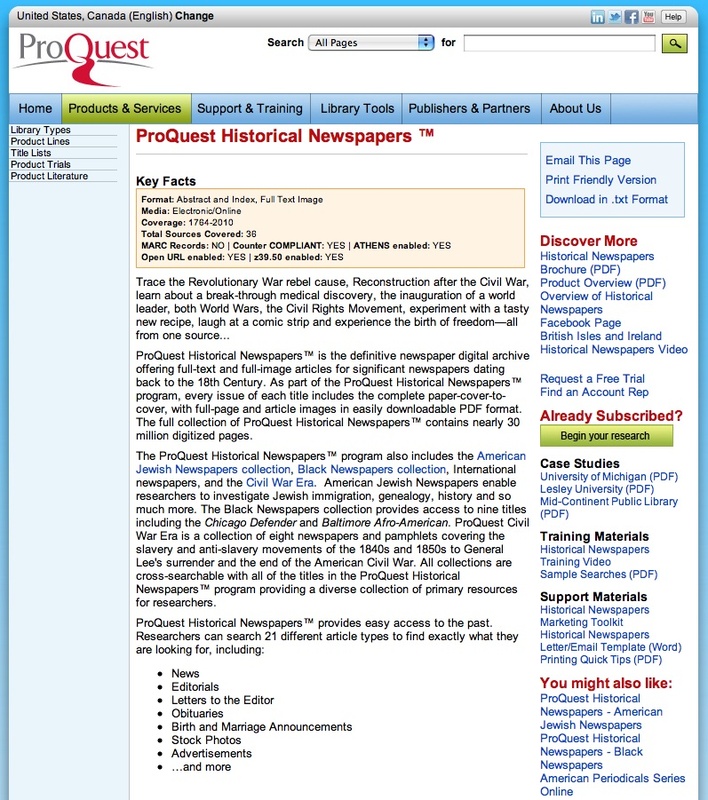 In particular, Pro Quest offers historical and current newspaper databases, providing access to full-text and full-image articles of any issue of the main U.S. newspapers dating back to the 19th century. The Historical Newspaper collection includes digital reproductions in downloadable pdf files of The New York Times, The Wall Street Journal, Los Angeles Times, The Washington Post and others. Very rich descriptions and detailed previews of the products are freely accessible, while access to records is on a pay-per-use basis. Demos, descriptions and free trials are also available. An advanced search option features a user-friendly interface and an international technical support is also provided – thus resulting in an easy navigation even for first-time users.